14 of the best Vidalia onion recipes from pizza to dip that you don’t want to miss! I L-O-V-E Vidalia onions. I love them raw in a salads and caramelized on just about anything. Their distinct sweetness makes them a favorite for so many people. Last year I had a chance to visit the Vidalia onion fields in Georgia. I was in Vidalia onion heaven. Fields and fields of Vidalia onions. You could smell the sweetness in the air. Every summer I look forward to Vidalia onions and I stash some away so I have them year round. I love to buy them in bulk, usually a 5 or 10 pound bag. I love Vidalia onions in my fall and winter chili, soups and stews so each time I get a bag of Vidalia onions at the grocery store I’ll chop or dice a few onions and freeze them so I have them throughout the winter. Look for the sticker on the onion with the number 4159 to make sure it’s a true Vidalia. 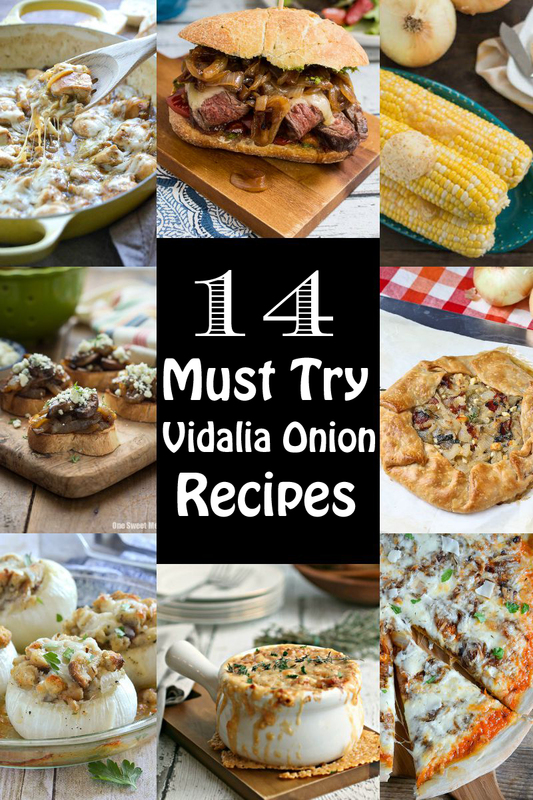 If you love Vidalia onions as much as I do then you will love these 14 irresistible, must try Vidalia onion recipes from some talented food bloggers. From pizza to dip these yummy recipes will sure make your mouth water. Want the recipe? Just click on the picture and you’ll be taken to the recipe. Click HERE to get a $0.50 coupon off 5 pounds of Vidalia Onions. Place in pantyhose and tie a knot between each bulb and just cut the knot when you want to use one. Store in a cool, dry, well ventilated place. Place each Vidalia on a rack or screen not touching in a cool, dry place. Chop, slice or dice and place in freeze to enjoy in soups and stews. Don’t miss a sweet thing from Vidalia! Stay connected with Vidalia Onions on Facebook, Twitter, Pinterest, Instagram + YouTube! Yum, I love vidalia onions!